confinement in a nursing facility. Eligibility requirements specify that the individual receiving home care services be at least 60 years of age, have a functional disability, and live in Randolph County. An assessment will be completed to determine home care needs. RCS employs Level 1 Certified Nursing Assistants and homemakers. Supervision is provided under the direction of a registered nurse. 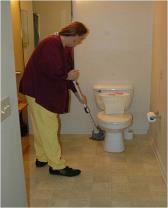 The Home Care Program is licensed under the Division of Facilities Services, NC Department of Human Resources. Regional Consolidated Services’ Home Care Program is funded through the Title III Older Americans Act and NC State Funds for the Elderly, and United Way of Randolph County. Persons receiving assistance can make monthly contributions to the program based on a sliding fee scale. Private pay clients are also accepted. ¨ Household duties (i.e. light housekeeping, washing dishes, vacuuming, etc. 1. Be informed in advance of any changes in the care and treatment to be provided. 2. Be informed in advance of any changes in the care or treatment to be provided by the agency that may affect the individual’s well being. 3. Participate in planning care and treatment, or changes in care or treatment. 4. Voice grievances with respect to treatment or care that is, or fails to be, furnished without discrimination or reprisal for voicing grievances. 5. Require confidentiality of all information in the patient’s clinical records. 6. Receive respect for the treatment of one’s property. · All items and services furnished by or under arrangements with the agency for which payment may be made under Medicare, Medicaid, or other Federal or State program of which the agency is reasonably aware. · The overage available for such items and services under Medicare, Medicaid, or other Federal or State program of which the agency is reasonably aware. · Any charges for items and services not covered under Medicare, Medicaid, or other Federal or State program and any charges the individual may have to pay with respect to items and services furnished by, or under arrangements with the agency. · Any Changes in the charges or items and services described above. 8. Be informed, in writing, in advance of coming under the care of the agency, of the individual’s rights and obligations under Medicare, Medicaid, and any other Federal or State program. 9. Call the home care agency at 336-629-5141 for information, questions, or complaints about services provided, or call the State’s Careline at 1-800-662-7030. 10. Refuse treatment within the confines of the law and to be informed of the consequences of this action. 11. Receive a timely response from the agency to a request for services. 12. Be admitted for service only if the agency has the ability to provide safe, professional care at the scope and level of intensity needed. 13. Receive information of the resources available if denied services based on inability to pay or the agency’s inability to provide services.